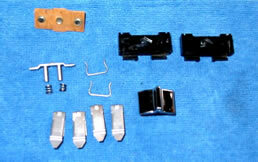 Often power window switches may not work or you want to dismantle one to re-chrome the housing or all of the above. Most of them are really simple to work on so you shouldn't be intimidated by the project. Were going to use the 57-58 style of switch to do this article. These are particularly easy to get apart and you don't see them sold as NOS anymore so saving your old ones is becoming a necessity. These are all of the parts that make up the window switch. They are so simple that there is not much to go wrong. contact points needing to be cleaned. These switches are held together entirely with spring clips. 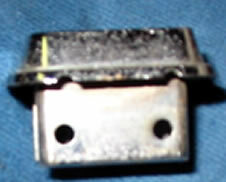 The clips that keep the switch in the door panel also hold the switch assembly in the housing. Tools of choice are a couple of picks. One straight, the other at a right angle, a small screwdriver & pliers. There is a round hole in the switch housing for each of the four clips. Lift up the outer pointed edge of the spring clip and insert the point of the straight pick into the hole on the housing. Push down the point of the pick at an angle in the hole to compress the spring clip and move the clip toward releasing from the housing. As soon as it begins to move you can stop and hooking the right angle pick into the clip pull it toward you and it will slide out. When all 4 of the clips are removed the switch will come out of the housing. The next step is to look closely at the switch when it is right side up. The black plastic housing is in 2 parts and held together with small wire spring clips. The wire clips are slightly flared at their ends so you can get under the end with the right angle pick and start it up off the plastic. As soon as the top of the clip is out of the groove you can remove it with a small pliers or the other pick. Remove the one at the other end of the switch and the switch will open. The indentation in the clip shows where it attaches to the hole in the housing. Once the switch is apart you can evaluate its problems. I started by taking all of the spring clips, the wire clips, the springs and the metal bracket that holds the springs to my bead blaster where I glass beaded them to get rid of some rust and dirt. Here�s a tip if you have a bead blaster. I use a stainless steel kitchen sieve that I bought at a garage sale for $1. It will hold the tiniest of parts and the beads will pass right through the sieve when you are cleaning. I have a very fine, soft rotary wire brush and I cleaned the contact points with that being careful not to press too hard. The result was the contacts became bright and looked polished. Fine emery cloth or sandpaper will achieve the same result. Meanwhile, I soaked the black plastic pieces in a small container of soapy water. While they were soaking I turned my attention to the 'knob' that operates the switch. It is a stainless steel cap over a plastic knob. I took it over to my polishing wheel and in no time it looked new again. I fished the plastic pieces out of their soapy bath and with an old toothbrush gave them a thorough cleaning. Suddenly I was ready to reassemble the switch. Of course the housing has to go out to the chrome shop so I'll have to wait a bit to make the assembly complete. So what about that master switch that goes in the driver�s door? Well it�s almost exactly the same as the individual switches. You�ll notice when you turn it over that on the bottom there is a strip that runs full length tying it together. It separates from its housing the same way as an individual switch. Once the switch is out you will see that there are four individual switches tied together at the bottom. The way it�s tied together presents a problem. The black plastic parts have a lip on their bottom edge that overhangs the fiber block. Since the fiber blocks are tied together there is no room to remove the plastic. My solution was to cut off the lip on the plastic piece that would be removed next. That allows it to be removed and provides space to remove the next piece without cutting. I used a Dremel tool with a cutoff wheel on low speed and it worked perfectly. Since the plastic sides of each switch are held to the next switch with pegs in each side, the switch will still be secure when reassembled. If you have later switches such as those used in the early 60s they come apart differently but are almost identical inside. If you pick up that switch and turn it over you will see that the switch housing appears to have been crimped over in 4 places. The metal here is relatively soft. 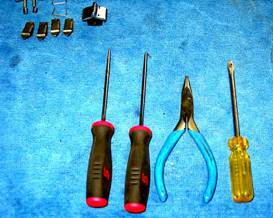 If you put the switch base on a solid steel surface and use a wide tip screwdriver you can hold the screwdriver tip against the crimp, tap it with a hammer and it will straighten. Work your way to the other 3 points and the switch will open revealing its contents. Clean and polish the contents, re-chrome the housing, reassemble the switch and there you have it. of disassembly very quick and easy. Master switch with 1st switch assembly removed. 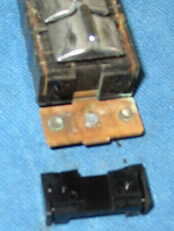 The switch, removed from the housing.